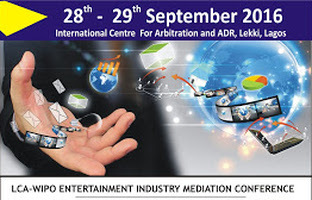 LCA-WIPO Entertainment Industry Mediation Conference | TMC | Toki Mabogunje & Co.
On September 28, 2016, the LCA / WIPO Entertainment Industry Mediation Conference will take place. It will be happening at Lagos Court of Arbitration International Centre for Arbitration and ADR, Nigeria, Lagos, Nigeria. The Lagos Court of Arbitration and World Intellectual Property Organisation, Arbitration and Mediation Center (LCA / WIPO), invites you to its Mediation Conference for Entertainment Disputes.